Swedish gaming giant NetEnt is celebrating the upcoming festival of football with a host of special World Cup casino promotions. Many UK casino sites will run the special promotions to celebrate the action in Russia, thanks to NetEnt. There’s a special live sport roulette live casino table, a live sports betting widget, a big money roulette promo and the chance to pick up extra free spins. The action kicks off on the same day as the World Cup, 14th June, but the excitement is building. Even if you’re not exactly taken with England’s chances, this Swedish firm could bring you success. Find out more about what NetEnt has in store for the World Cup in this article. Discover how to enter and exactly what you could win as the goals fly in at the world’s greatest sporting spectacle. The first strike as part of NetEnt’s goal haul of World Cup casino promotions is Live Sports Roulette. The game development giant is well known for bossing the live casino world, but this goes one step beyond. Throughout the World Cup, you can keep track of the action in Russia whilst you lay bets on the wheel. You don’t need to keep flicking between tabs, NetEnt does the hard work for you. Expect live scores and in-game stats from World Cup matches to be streamed in the background of the table, keeping you up to date. The dealers will also chat about the games and interact with players about what is going on. The live casino experience just took on a whole new dimension. This also means that this technology can be rolled out for all sorts of future events. They don’t even necessarily have to be football related. You can take your seat at the NetEnt Live Sports Roulette table from Thursday 14th June, when Russia kick off their home championship against Saudi Arabia. With most new casino sites offering NetEnt games, you should be able to easily find this game. As an extra bonus for those who love live casino games as much as football, NetEnt’s sports betting widget is here. Wherever you are in the live casino, you can stake on the World Cup action. Between blackjack hands, you can indulge in some sports betting without leaving the site. This is multitasking at its finest and a really handy aspect of these World Cup casino promotions. Back in last November, NetEnt introduced the Free Rounds Widgets, which proved very popular. UK casino sites used it on games that offered free spins to up the stakes even further. Players faced a wheel of fortune, which they could spin to win more free rounds. The widget is back for slots games at NetEnt casinos like Mr Green and Casumo, but with a footy theme. Expect to see it pop up during your gaming over the month that the World Cup is on in Russia. Is it worth spinning the wheel? It’s certainly less risky than backing England in a penalty shootout. There are liable to be all sorts of World Cup casino promotions on offer over the next month, but NetEnt is in first. 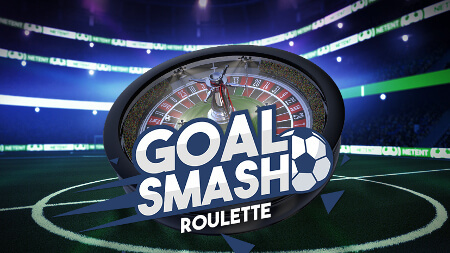 The Goal Smash Roulette promo runs from 00:00 on Thursday 14th June until 23:59 on Sunday 15th July (both Central European Time). There are two parts to it, with daily casino bonus giveaways and a series of prize draws with a combined €75,000 up for grabs. If you fancy giving this competition a go, but need to brush up on the roulette rules and strategy, don’t fear. SpinCazino’s How to Play Roulette page tells you all you need to know to get started. NetEnt boasts its own famous football slots game. Football: Champions Cup came out just before Euro 2016, but is entirely fitting for the World Cup too. It’s a moody affair underneath the floodlights. This slot should help you ramp up the excitement ahead of this year’s tournament. The game features five reels and 20 paylines, with a jackpot worth 1,051 times your stake. You’d certainly be celebrating like you won the World Cup if you racked up that kind of victory! You can play Football: Champions Cup at Dunder Casino right now. Play’N Go has also jumped on board the World Cup gravy train, with Hugo Goal. This nw slot featuring the lovable cartoon character is very much the other end of the spectrum. It is, however, immersive and feature packed, especially for a three-reel slot. If you love football and playing at UK casino sites, keep an eye on these pages for more World Cup casino promotions. As the carnival of football explodes onto our screens, the iGaming world will be jumping all over it. Good luck and enjoy everything NetEnt has to offer!